on QV 2d OFFICIAL (SG.05). on QV 1d OFFICIAL (SG.04), rare on this. on QV ½d OFFICIAL (SG.01). 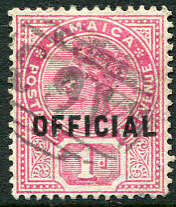 on QV ½d OFFICIAL (SG.01), very rare on this. 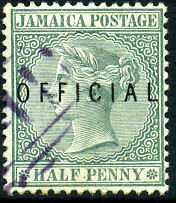 on QV ½d OFFICIAL (SG.03), surface fault and toning, very rare on this issue. on QV 2d OFFICIAL (SG.05), horiz. crease. 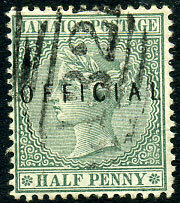 on QV 1d OFFICIAL (SG.04), thinned lower left corner area, rare on this. 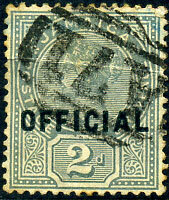 (Type O) on QV ½d OFFICIAL (SG.02), very rare on this. (Type O) on QV 2d OFFICIAL (SG.05). 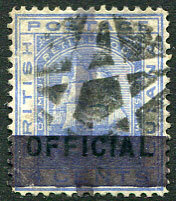 on QV ½d OFFICIAL (SG.01), very rare. on QV 1d OFFICIAL (SG.04), very rare on this. 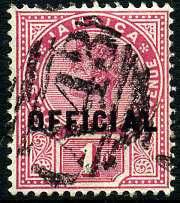 on QV ½d OFFICIAL (SG.01), rare. on QV ½d OFFICIAL (SG.03). on KE7 1d OFFICIAL (SG.02). 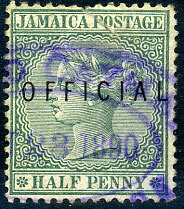 part strike in violet ink on QV ½d OFFICIAL (SG.01), very rare. (D/R) MR 16 96 on QV ½d OFFICIAL (SG.03).